When faced with a bird problem a specialised bird removal procedure must be carefully planned and executed. Using the services of a professional pest control company is the most appropriate course of action. Only then can you be sure that the method used will keep the birds distress to a minimum level, avoid attention of the public and comply with pest and bird control law. Bird trapping is a very effective solution for the short-term reduction of an unwanted bird population. There are a range of different designs that can cope with capturing birds, for example pigeons, and are an effective and humane way to remove them. Bird trapping offers a compassionate way of capturing one or more birds by using a strong and durable trap that can be located in a number of different places. Depending on the type of bird to be trapped they can be used in trees, on walls or on the side of a building. The traps are baited with a food that will attract the particular species that is causing problems and the experience of a professional will ensure the right spot is chosen for its location. An expert pest control service will be able to find the right site for the trap and position it for ease of access. A place where there is high activity but one that is not overlooked by the general public is most suitable as many people may find trapped birds a little distressing. If pigeons are the problem the trap will be baited with pigeon corn or some other food source and the birds will be able to enter the trap and feed freely for up to 7 days. 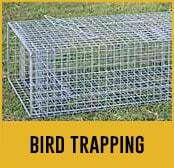 This is done so that the bird feels safe and when the trap is finally set it will be able to capture a maximum number of birds. In the trap there is a two way door that will let the bird enter but prevent them from getting out. When the trap is set it will contain food and water and be visited by the pest control experts once a day. During this visit any captured birds are removed and dispatched in a humane way. This method may seem a little drastic but is essential because re-locating them in another area will mean they are highly likely to go back to the original nesting site. This would mean wasted effort and money both for the customer and the pest control company. Trying to solve the problem yourself is not the correct course of action. Professional intervention is a sure fire way to be certain the issue will be resolved quickly, efficiently and with minimal pain for the bird. Allowing the bird population to keep on expanding is likely to cause damage to your property and put you and your family at risk of catching a nasty disease. Take advantage of a licensed bird control service and stay on the right side of the law.